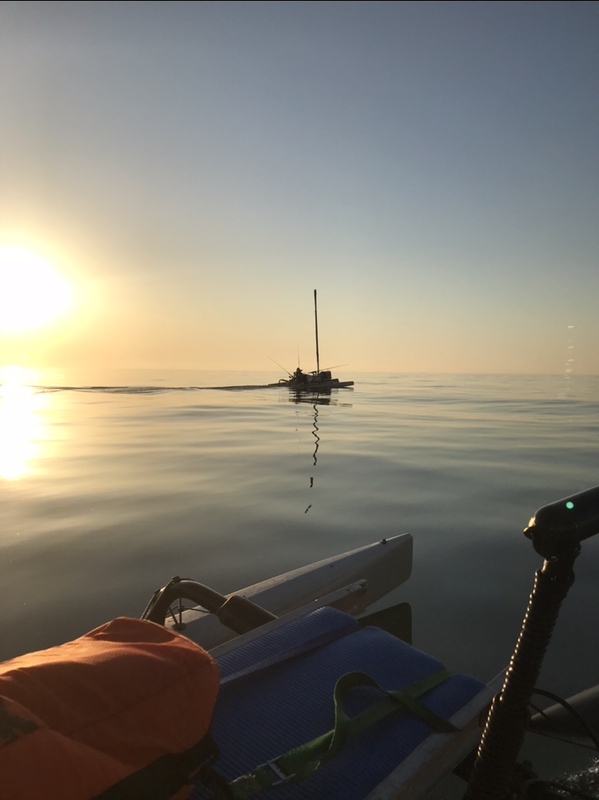 Kayak anglers are routinely found six to seven miles off the Texas coast, but there are those who brave long runs and the potential risks awaiting 20 miles offshore. While being so far offshore does present conceivable hazards, this extreme form of kayak fishing opens up the doors to pelagic species found in the clear waters far from the safety of the shore. 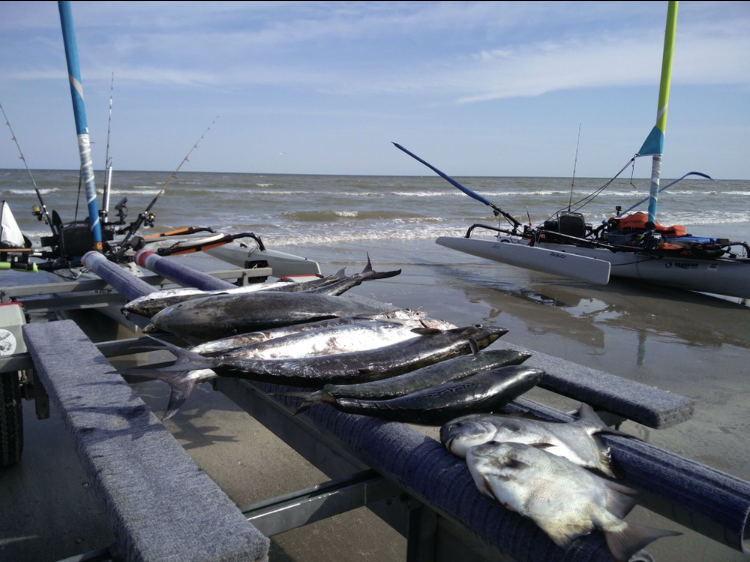 YakGear brand ambassador William Swann hails from Texas City, Texas, which is situated along the waters of Galveston Bay. Growing tired of catching the same species each day, Swann eventually worked his way further and further out, and found that a new world of kayak fishing opportunities opened up for him. He has many tales of bobbing on rolling waves and being dragged for miles by some of the most coveted species offered by the deeper waters off the Texas coast. Swann didn’t jump right into extreme offshore kayak fishing. The angler took incremental steps and now often finds himself 20 miles out. The angler’s offshore rig is purpose-built for 40-mile runs to find deeper waters in Texas’ shallow-sloping continental shelf. Swann’s Hobie Islander is equipped with a 16-foot sail, but the angler makes his long kayak fishing runs with a Suzuki 2.5 horsepower short shaft outboard. While some offshore kayakers use a center console boat to get to their destination, a kayak/outboard combo is advantageous over a powerboat for several reasons. To get the most from his day of kayak fishing on the water, Swann plans ahead and designates two spots he will target – one near shore and another point far from shore. The near spot is usually 10 miles or so off the Galveston shoreline. Man-made reefs and wrecks are go-to structures to find fish. Oil rigs are also a popular stop for Swann. looks to target structure during his time trolling from his near and far locations. Swann trolls a variety of baits including a Halco Max 130, Yo-Zuri Crystal Minnows, Halco Twisty, Tsunami swim jig and just about any gold spoon. At his far kayak fishing spot, Swann can have up to three active rods out with a back up to pitch to any schooled fish. While the multiple setups may sound complicated, Swann relies heavily on his RAILBLAZA rod holders to keep everything firmly attached to the boat and simplify his operation. Once Swann gets to his offshore location, he begins his search for mahi and cobia – two species prized for their taste. The angler uses a mix of live baits including blue runners and bumpers. For trolling, Swann’s go-to bait is ballyhoo. For bottom snapper rigs, he uses squid. Swann rigs his presentations to a FishStix MVP rod with Avet reels, including the SX and SX Raptor. With no land in sight as they search, Swann and his partners bob and dip in the waves, facing the uncertainty that comes with kayak fishing so far away from the safety of the coast. Swann has a few words of wisdom to anyone looking to chase the horizon but are reluctant to take the leap. Swann recognizes the perils that come with running such long distances, but mitigates the dangers by fully preparing for just about any emergency. Swann goes against convention to not only fill his cooler, but to connect with nature.